Long-term sea level variations are an important indicator of global climate change, and their measurement can provide critical information for determining the socio-economic impact of sea level change on coastal land use. Sea level change over the past century is studied almost exclusively using tide gauge records, but they suffer from the unknown effects of land motion and poor spatial distribution. The advent of satellite altimetry, and especially the launch of TOPEX/POSEIDON in 1992, overcomes many of the limitations of tide gauge measurements in that the measurements are global and are tied to the Earth’s center-of-mass in a precise reference frame. However, uncertainties still arise with regard to the long-term performance of the instruments, and the maintenance of the reference frame from one altimeter mission to the next. Here, we discuss the importance of the reference frame for altimeter measurements of sea level. Our results show that care must be taken to maintain the reference frame across multiple geodetic techniques and multiple decades if climate change signals are to be detected. 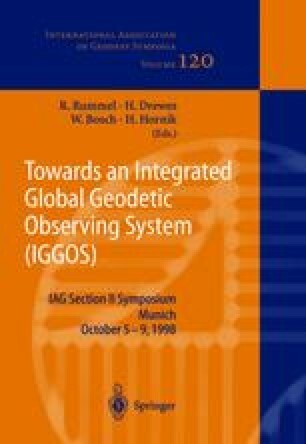 The movement of the tide gauges and the geodetic observatories tracking the altimeter satellites (SLR, DORIS, GPS, etc.) must be precisely monitored through a well-organized international effort.